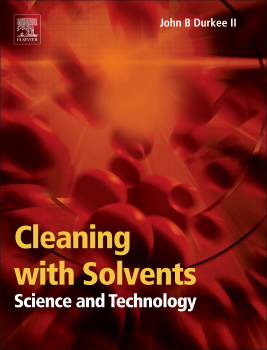 A new book by Dr John Durkee III Cleaning with Solvents: Science and Technology tackles all these issues in a way that satisfies those who need a scientific understanding of the issues as well as those who are looking for specific, well-reasoned, recommendations that they can apply to their work place. One key theme running through the book is that however cheap, safe, environmental a solvent might be, if there isn't a good HSP match to the soil then it is not going to do the job. This is backed up by Durkee's insider knowledge of what actually works right across the cleaning industry. HSP is used throughout the book not just because it's a scientifically sound way of approaching the topic, but because the author has taken the trouble to find the evidence of strong correlations between a good solvent-soil HSP match and good cleaning performance. One such example is the graph of HSP distance (Ra) versus % soil remaining on the test sample after cleaning. This graph allowed Durkee to introduce a simple heuristic that any solvent/soil distance > 8 would give poor cleaning, allowing a focus only on those solvents and blends that had a sub-8 distance along with all the other desirable features of a solvent. This greatly narrows the choices available and avoids lots of wasted effort on solvent systems that are nice in many ways but are no-hopers in terms of cleaning efficiency. As an example of the rational process, assume that you want to use solvents that are VOC Exempt.You can choose from a selection of solvents that are either VOC Exempt in the USA and are potentially useful for vapour degreasing (up to HCFO-1233-zd) or VOC Exempt in Europe and (because of their high BPt) potentially useful for cold cleaning. The 4 numbers are δD, δP and δH followed by BPt. Some representitive soils are provided with their δD, δP and δH values. 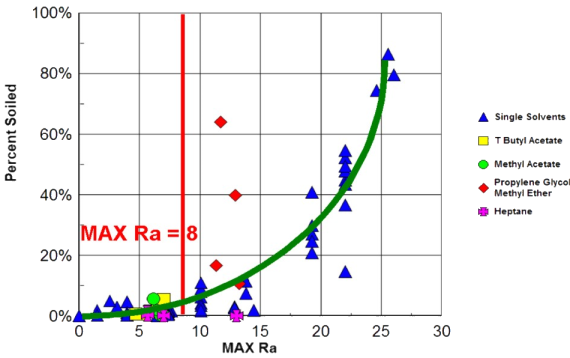 If the calculated Distance (Ra) is greater than 8 then the chances are that the combination will not work well. One of the most astounding extrapolations of HSP theory was to predict a good cleaning performance for an alkane/water mix, using the HSP average of the two solvents. This sounds nonsense as we know that alkanes and water don't mix. The trick is that some of these mixes are good azeotropes, so it is possible to do vapour degreasing with this extraordinary solvent blend. Although both Charles and Steven provided some guidance during its writing, the credit for such an excellent book (in glorious colour both in hard copy and eBook format) is fully Dr Durkee's. It is highly recommended.